‘Weed out’ Back pain when gardening! Gardening for many people is just a chore that has to be done, whereas for others it’s their hobby and a great joy to be out in the garden. In both cases it is important to prepare and protect the joints and muscles of your spine prior to descending on your garden. Whilst lying on your back (preferably on a firm surface), with both hands around both knees, gently pull the knees to your chest or as far as is comfortable, hold for 5 seconds then gently lower. Breathe slowly and relax throughout. Whilst lying on your back (preferably on a firm surface), with your knees bent, keeping your shoulders on the floor slowly roll both knees over to one side, hold for 5 seconds and repeat to the other side. Relax your arms by your sides, or with your hands resting on your abdomen, elbows on the floor. These flexibility exercises should be performed before and after gardening. The first step to lifting a heavy object safely is to get as close to it as you can. Ideally, the object should be underneath you. Next, take a wide stance. Your legs should be wider than your shoulders, with your weight anchored firmly onto the ground or floor. Try different foot positions until you find the one that feels the most stable and comfortable. Try putting your left foot forward, then your right. Or keep them parallel, but widen your stance. Bend your knees and lift the object from underneath. You will be using the muscles in your hips and legs to do the heavy work. Minimise bending at the waist, which can strain your back. If you are lifting an unwieldy object, like a heavy bag of soil, get someone to help you. A great trick for making sure you’re lifting objects safely is to keep a long spine. Think about a straight line going from your head through your spine all the way down to your coccyx bone. Your body should stay in that position when lifting. Keeping your arms close to your body helps ensure that you’re lifting an object safely. When lifting your object, keep your knees in line with your toes. Don’t let your knees drop inward or outward, this will help your body stay aligned during the movement. Position the shovel’s blade so that it is level. Ideally, it should be parallel to your hip bones (pelvis) in the front, assuming your hip bones are level. Position your feet so that one foot is in front of the other, then place your front foot on the shovel blade. Anchor your back leg into the ground to give you stability. Lean your weight forward onto the shovel. Let the weight of your body sink the shovel into the ground. Notice that the model in the picture is keeping her spine in a ‘long line’. To lift the dirt up, shift your weight to your back leg, using a gliding motion of the pelvis. Make sure you bend at your hips and knees, and not your back. Leverage the shovel out of the ground by bending the knees (especially the back leg) to lower your body down more. By lowering your body down when you lift the shovel up, you are positioning your centre under the weight that you are trying to lift, and harnessing the power of the pelvis, hips and legs rather than the back. Instead of heaving the dirt over your shoulder or behind your body, move your whole body to where you want the dirt to go, and then just turn the shovel handle to let it fall there. Whilst sitting you take the pressure off your feet, legs and back. You can maximise this effect by positioning yourself so that the weight of your body is supported through the bones. Locate your two sitting bones (on the bottom of your seat) and make a firm connection between them and the bucket. Keep your feet planted firmly and evenly on the ground. Spread your legs apart, and position your arm into your leg to help secure your sitting. Sitting with a wide base of support will help establish a stable body position, one that will come in very handy when you start reaching for the weeds. In the wide-legged sitting position, you can support yourself as you begin to reach for the weeds. Just use your elbow on the inside of your knee to create an external brace for your body posture. When it’s time to really dig down and get those weeds, the brace you’ve made with your arm into your leg can take the pressure off your back. When it’s time to unload the wheelbarrow, remember to bend from the hips and knees before you lift. Bending down will allow you to pick up the wheelbarrow from underneath, which is more efficient and will give you more leverage. Now switch to an underhand grip. This will help you avoid wrist, arm, shoulder and neck strain when lifting the weight of the wheelbarrow straight up. Because you’ve bent from your hips and knees to lift the wheelbarrow, you now have the power of those muscles on your side. Begin to straighten your legs. To empty the wheelbarrow, straighten all the way. Lean your weight forward onto your front leg. Remember to keep a nice long line from your head, through your spine down to the very bottom (your coccyx bone). Adjust the height of the handles so that you are comfortable pushing the mower. You can experiment with the height by starting with the handles positioned at chest level and seeing how that feels. Then, continue adjusting higher or lower until you feel it is right. But remember, positioning the handles slightly lower will give you more leverage. Before you even start the mower, establish your wrist position. For the least amount of strain, your wrists should be in an unbroken line with your forearms. Position your elbows at an angle that is comfortable for your shoulders, one you can sustain throughout the entire task. Not only will elbow angle vary according to your mower’s handles, but it will also be influenced by your upper back, neck and shoulder posture. Once you have your working angle, keep the tone in your arms, this will help you maintain your elbow positioning the entire time you mow the lawn. Finally! It is time to actually start using the mower. For this, you will use your body weight. Lean your weight into the mower to get it going. Doing this will help you avoid getting your back involved, which will help prevent strain. 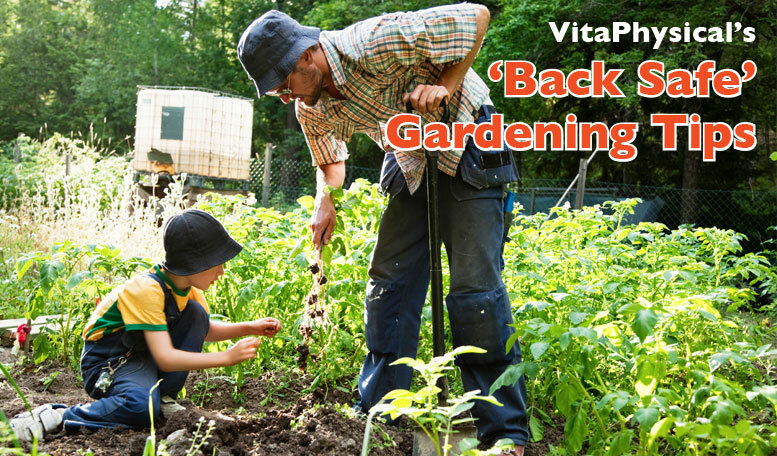 We hope you have found this information helpful, but remember if you do get and gardening-related Back Pain, contact VitaPhysical for further advice and treatment. Do not leave it to go away on its own, the earlier the treatment is carried out the better.